Warm baked brie with cranberry sauce, pistachios, orange zest, and Truvia Nectar. Serve with toasted bread or crackers for a festive cranberry appetizer! A couple of weeks ago I sent out a survey to my awesomely stupendous email subscribers to see what holiday flavors they’d like to see in holiday recipes. I included all the usual suspects, like pumpkin, eggnog, and cinnamon. I didn’t include fan-favorites like chocolate or vanilla (since those are always holiday staples in my mind) but I did cover all the greatest hits that usually only become popular during the fall and winter seasons. And do you know what the breakout front runner flavor of this survey was? I have to say I was a little surprised at this result, but I’m also totally on board. I already have a few cranberry recipes in the works, but I figured I’d kick things off proper with this cranberry appetizer. It’s my favorite thing in the world right now. Another big perk of this recipe is that it takes advantage of Truvia® Nectar. We all know that the holiday season is ripe with delicious sweets, but if you’re anything like me, those sweets are also the reason why so many of us make “new you” resolutions in January. As much as I love all that glorious, tasty food, it can come at a high price. So if you’re looking to “take the edge off” your holiday indulgences, Truvia Nectar makes for an easy and low-calorie substitute (it’s made with stevia and honey, with 50% fewer calories than sugar) for any recipe or treat that uses sugar, honey, or agave. Truvia Nectar is also twice as sweet as honey, so you only need to use half as much. Note: Truvia Nectar is just starting to appear in stores at the time of this post. It’s currently available in both a 3.52oz bottle (pictured) and a 10oz bottle. Now, for those that read this little food blog on a regular basis, you know how much I love appetizers. I could literally make a meal out of finger food, and quite honestly, this baked brie was no different. Plus, when using Truvia Nectar, I don’t feel nearly the guilt about taking out a whole wheel of brie with delicious cranberry sauce and pistachios on my own. Because I totally did do that. 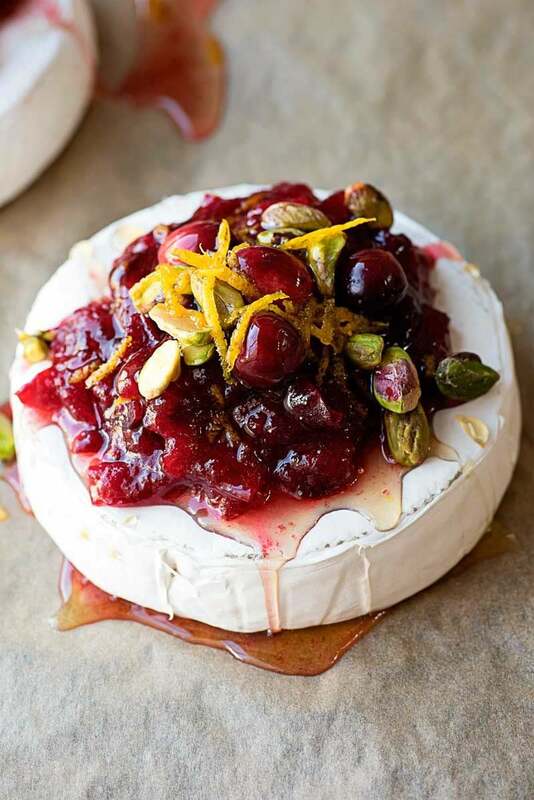 The sauce in this cranberry appetizer and the orange zest were the perfect compliment to the mild brie, and the pistachios added just the right amount of holiday crunch. I can totally see this being my go-to appetizer for all the festive get-togethers we’ll be having in November and December! Want to try a FREE sample of Truvia Nectar? Click here to claim yours! Preheat oven 325 degrees F. Line a baking sheet with parchment paper, then set aside. While oven preheats, add cranberries, Truvia Nectar, water, and 1 tablespoon of orange zest in a medium saucepan and bring to a boil over medium-high heat. Reduce to a simmer and let cranberry sauce simmer for 10 minutes, stirring occasionally. When sauce is cooked, remove from heat and cover to keep warm. Place 3 wheels of brie on prepared baking sheet and bake for 10-12 minutes. 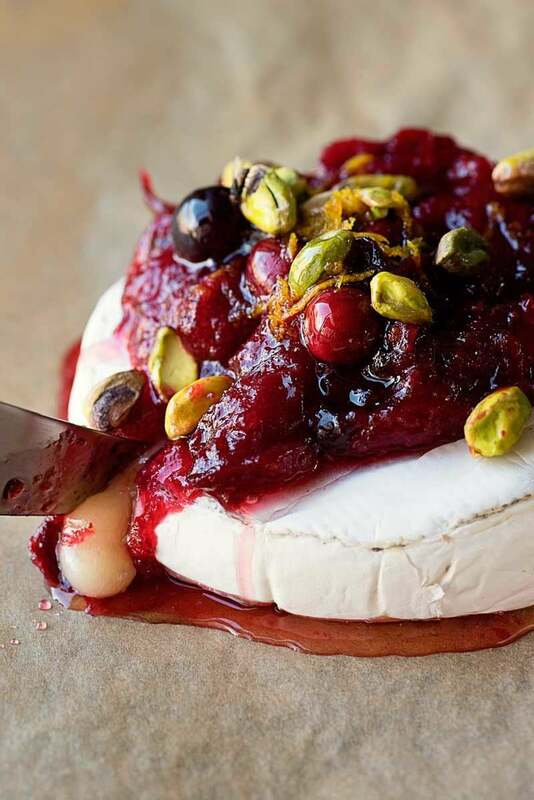 Place baked brie on serving plates and top with warm cranberry sauce, 2-3 tablespoons of pistachios, the remaining orange zest, and more Truvia Nectar drizzled on top. See above video for an example. Serve baked brie immediately with crackers or bread for dipping. I would like to try the roasted brussel sprout recipie. I’m afraid that the sweet iced tea is about all that I’m capable of “cooking” up! I love the look of the No Bake Pumpkin Cheesecake, I bet it’s insanely delicious! The character I chose is Rosita. SOUNDS GREAT, I TRIED GRAPE NUTS AND YOGART BUT NOT YET THIS.. CANT WAIT!